King of Bandit Jing is a seven volume manga series by Yuichi Kumakura, and has been adapted into a Thirteen Episode Anime by Studio DEEN. Jing is an enigmatic young wanderer living in a surrealist world of fantasy and treasures aplenty. His travelling companion is Kir, a wisecracking albatross with a penchant for beautiful women. Yet few suspect this boy is actually the mythical "King of Bandits", a Phantom Thief capable of stealing any valuable no matter how rare or well-guarded it may be. With a fast wit and a good heart, Jing pits himself against the selfish and unjust of the world in his quest for the ultimate prizes. The manga and anime are a series of short standalone stories written around the treasures sought after by Jing. He is usually accompanied in each adventure by a "Jing Girl", a female companion whose personal story arc is tied closely to the specific tale she appears in. Much of the appeal of the series comes from the visual style and composition of the setting, bordering on Expressionist. The anime adaptation shifts a few of the original manga's story arcs, as well outright substituting a few them for ones unique to the show. Notably, its three part finale is only the arc of the manga's fifth volume. Immediately following the manga, Kumakura went on to create a sequel series called, King of Bandit Jing: Twilight Tales. Also coming at seven volumes, Twilight Tales did away some of the sillier aspects of the original and carries a darker, more mature tone; Jing himself is apparently a few years older by this point as well as Kumakura's style seemingly having settled with the approach of the final volume of the original series. On the other hand, the closest that the anime series got to a sequel was an OAV called "King of Bandit Jing: Seventh Heaven", an adaptation of the fourth volume of the original manga; this somehow managed to be even more incomprehensible than the initial series run already was. Aborted Arc: The second story arc ends with Sherry vowing revenge on Jing. She never appears again. Adaptational Nice Guy: Jing in the Anime seems to be more noble and gentlemanly than his manga counterpart. For example, in the first chapter of the manga, Jing managed to break in the top of a tower by stealing a dragon's egg and having Kir fly away with it, so that Jing could ride on the enraged dragon as it goes Mama Bear over the egg. In the Anime, the egg was stolen by the Big Bad's servant, and Jing simply goaded the dragon to chase after it. And the Adventure Continues: Twilight Tales ends on this kind of note after Jing returns for Picon. See No Ending entry below. Arm Cannon: Kir's attack mode, also seen with Sherry; seems to be an ability of certain animals. Art Evolution: Jing's design alone changes drastically over the course of the manga. Especially prevalent in the original series, the look Kumakura seems to settle with by the time of the last volume is carried into the sequel series; Twilight Tales. Badass Longcoat: Jing's is bulletproof and bright yellow-orange; he loses it momentarily in the final volume of Twilight Tales. Blade Below the Shoulder: When not using Kir - this is Jing's preferred weapon, a long retractable blade attached to a gauntlet he wears underneath his jacket; in the original series it was a curved blade, by Twilight Tales he's opted for a larger double-edged straight blade. Calling Card: When he chooses to leave one - it'll have the standard "i'm going to take this" message and display his signature symbol; a black cat mask with swirly eyes. Calling Your Attacks: "Gimmie a Kir Royale!" Character Tic: Jing really likes "shooting the bird" but it makes sense considering how he and Kir attack. Chick Magnet: In most of the different arcs, any major female character (or "Jing Girl") will fall for Jing. Chivalrous Pervert: Kir often flirts. Casanova Wannabe: So far, in the manga, the only girl he scored so far was another female crow. Interestingly, most of the time, the girls not rejected him because he's a bird, but because they usually have emotional baggage need to be resolved. A Day in the Limelight: Kir gets one in Episode 9, easily the most plot driven episode in the series. Dances and Balls: The episode "The Masquerade Ball of Zaza" features one. Defeat by Modesty: Jing defeats his first-round opponent in "The Masquerade Ball of Zaza" by snatching off the rear end of his armor. Excalibur in the Rust: The key to a Humongous Mecha was disguised as a worn down sword. The Faceless: Played with in the Zaza arc, a masked tournament. Genre Savvy: Kir sees a bunch of coffins opening and asks, "Is this the part where all the mummies come out and get us?" Gentleman Thief: Jing the heroic bandit king. Girl of the Week: Almost every time Jing goes to a new location, he is assisted by a beautiful girl who plays the role of his Love Interest. Of course, they never come with him as he moved on to the next treasure, so their romance are always short-lived. Gratuitous Foreign Language: The manga is littered with signs in multiple languages and scripts. Most if not all of them are nonsense anyway. Furthermore, the sound effects are written in both English and Japanese - sometimes in the same panel. Iconic Item: Jing's bright yellow-orange longcoat, he's almost unrecognizable without it. Intangible Theft: Jing claims to be able to steal anything and that is what he does. He does concede defeat after discovering that one treasure is a landmark. Given that he has succeeded in stealing greed, a dream, and a smile, this is quite an admission. However, each of the three things he stole did have a physical representation that was small enough to carry one-handed. I Will Wait for You: Stir from "The Masquerade Ball of Zaza" refuses to dance with other men at the ball, implying that she is reserving her next dance for the time when Jing returns. Last Girl Wins: Manga only, in Twilight Tales, after having left an impression a wide number of girls throughout his journey Jing actually returns to take Picon along with him. Just a Kid: Most of the characters don't take Jing seriously because of this, and is what allows him to get by without a disguise more often than not; although there are those that do at least recognize him. Masquerade Ball: Again, a huge portion of "The Masquerade Ball of Zaza" is dedicated to this. McGuffin: All the episodes revolve around one of these. Meaningful Name: All of the main and recurring characters are named after alcoholic beverages. Also, the episodes are numbered as "Shots" and Kir's Wave Motion Gun is called "Kir Royale". No Ending: Neither the manga, its sequel series, nor the anime have an actual ending. Non-Human Sidekick: Kir, Jing's perverted bird sidekick. Prison Episode: When Jing heads to the prison Seventh Heaven in order to find Campari and steal his dream-making power. Ridiculously Human Robot: The Jing Girl in the Reviva arc is only revealed to be an automaton when she winds down and has to be fixed by her creator. Her search for the immortality formula made the illusion even more convincing. The Rival: Every arc has someone either competing with Jing for the McGuffin or he already has it and is trying to protect it from Jing. Samus Is a Girl: The Warrior of the Rising Son turns out to be Stir. Schizo Tech: Technology varies wildly from place to place. Shout-Out: In episode 9, Kir can be heard singing the Theme song for 'I dream of Jeannie' while sweeping. In the manga, the Elixir of Life arc features a nice bit for older fans—the celebratory song of the Kingdom of Corpse is an obvious filk of the Muppet Show theme. Spoiler Opening: The OP sequence of the anime series contains scenes from every story in the show, albeit highly stylized and out of context. Talking Animal: Kir and many other non-human characters in the series. Theme Naming: Alcoholic beverages. It's not too far fetched to consider the entire show as a drunkard's hallucination. - volumes of the manga are "bottles," and individual chapters are "shots." Tournament Arc: The story arc "The Masquerade Ball of Zaza." Visual Pun: Jing "shoots the bird" to his enemies to taunt them. 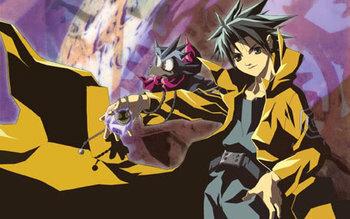 To attack, Jing turns Kir into a weapon that fires energy blasts, so he then literally "shoots the bird". Wave Motion Gun: Kir can turn into one of these when he fuses with Jing's arm. Who Wants to Live Forever? : The Aesop of the Eternal City Of Reviva arc. "As long as this world is full praise...The King of Bandits will continue to steal."